Ukraine’s first President Mykhailo Hrushevsky died in Kislovodsk on Nov. 25, 1934. He was a noted historian and active public and political figure. The year 2009 marked the 75th anniversary of this tragic event. Hrushevsky’s scholarly legacy appears to have been largely covered by Ukrainian researchers, above all historians. However, Hrushevsky as a celebrated philologist and the author of the six-volume History of Ukrainian Literature remains to be analyzed in greater depth. In this article I will try to lift the veil over Hrushevsky’s concept of literary criticism. Now that Ukraine is formulating its motto as a member of the European community of nations, it is important to once again consider the Ukrainian Baroque period. As shown in numerous monographs by contemporary Ukrainian scholars, Ukraine was inseparable from Western European culture at the time. It was during that final period of the Baroque epoch that the Russian vector began to take shape in the chronicles. Therefore, I will dwell here on Hrushevsky’s concept of the Ukrainian Baroque. His scholarly works reflect an attempt to carry out a great deal of metahistorical work by singling out the concept of national Ukrainian evolution through the prism of national history and culture. His History of Ukraine-Rus and History of Ukrainian Literature are all-embracing conceptual models of national history: the first one reflects this history in the historical paradigm proper, while the latter constructs a historical- textological model. I might as well point out that, apart from the two abovementioned fundamental works, Hrushevsky’s concept of the Baroque is reflected, sometimes only in the outlines, in his numerous works on history. In 1917, he published the book On Political Life in Old Ukraine. Essays, Articles, Speeches that included his works on Ukrainian history in the 12th through the 17th centuries, previously published in the Proceedings of the Shevchenko Scientific Society and the Literary-Scientific Herald (1891–1912). In other words, this publication embraces the historical period associated with the Baroque epoch. Hrushevsky included in this book materials concerning political events perceived as controversial by the public: “Khmelnytsky and the Khmelnytsky Movement,” “250 Years” (in conjunction with the anniversary of Ukraine’s annexation to Muscovy), “Bohdan’s Anniversary,” “Vyhovsky and Mazepa,” “Swedish-Ukrainian Alliance of 1708,” “Mazepa Period,” and “Bohdan Period.” Hrushevsky’s historical works help understand his attitude to the Baroque period and its importance for the establishment of the Ukrainian nation. For want of room these works cannot be analyzed here, but they can be studied by those who wish to have a better idea about Hrushevsky’s concept of Baroque culture. Let me now return to his major work. In the introduction to his fundamental History of Ukrainian Literature, the author notes that he understands literature as a sum total of aesthetically perfect texts: “The term literature was first used by Cicero who understood it as literary knowledge, grammar. With time it has acquired the meaning of a sum total of monuments in writing, everything committed to paper, left by a certain period or a certain people; a certain literary category (as in ‘mathematical literature,’ ‘dramatic literature,’ etc.). In the scholarly usage, history of literature is understood as a historical overview of the belles-lettres only, i.e., refined literary works that meet our aesthetic requirements.” Further in this article I will demonstrate that the aesthetic criteria recede into the background when Hrushevsky analyzes 17th-century texts and that the works under study played an important role in the formation of cultural life in Ukraine. The model of Ukraine (in its literary representation) reflects the author’s desire to recreate the national way of life, place Ukrainian culture into the context of world achievements, and emphasize the continuous dialog and active communication processes between Ukrainian and European cultures, the interrelationship between Ukrainian and European cultural and religious life. At the time when Hrushevsky was writing the History of Ukrainian Literature, scholars tended to believe that this literature should be studied starting from the 15th century. Regarding the concept of the Baroque, which is realized in the History’s concluding volumes, it is safe to say that studying this cultural and historical period involved a number of problems. Current scholarly literary studies have repeatedly confirmed that the Baroque period reflected the historical situation in which Ukraine was part of the European political, social and cultural context. This paradigm of the history of Ukrainian literature was, of course, regarded as nationalistic at the time Hrushevsky was working on this book. Hrushevsky worked on the concluding volumes of the History of Ukrainian Literature in the twilight of his life. He edited the sixth volume and updated it, adding and revising articles, which is proof of the importance he attached to this book. It had to be a major research work that would reveal the scholarly concept of the Ukrainian nation’s progress. A letter from Kateryna and Mykhailo Hrushevsky to M. Mochulsky (Sept. 18–22, 1932) shows that the scholar was working on a continuation of the History. He had revised the manuscript of the first part of the sixth volume (embracing the period until 1663). They had already started to compose it, but in the spring of 1931 the process stopped. In 1931–32, Hrushevsky studied scholastic literature until the time of Hryhorii Skovoroda. While in Moscow, he had to prepare a scheduled presentation and deliver it at a sitting of the USSR Academy of Sciences. The topic was “Several considerations Regarding the 18th-Century Ukrainian Historiography.” He wrote down the key points, but his physical condition worsened and he couldn’t deliver it. He asked to have his theses read and included in the academy’s Doklady (Reports) or Izvestia (Proceedings). Hrushevsky wrote: “The History of Literature is aimed at conveying the image of the literary enterprise in the broad sense of belles-lettres … studied in its historical development in a certain epoch or a certain people. To this end it is necessary to study literary material that belongs to this period or people, selecting the most important and characteristic works, drawing the reader’s attention to them, and explaining them based on the general conditions of literary writing, aesthetic moods, and cultural circumstances of a given epoch. On the other hand, these works should be analyzed to show the characteristic features of literature in a certain epoch and show its progress, evolution. Omeljan Pritsak is right in saying that Hrushevsky’s sociological and historical concept is based on the theory of factors. Reconstruction of the Baroque period (its literature, in particular) is also found in Hrushevsky’s History of Ukraine-Rus in which the author constructs a historical model of the Ukrainian nation in the period under study. I should note that Hrushevsky was the author of the script Zaporozhtsi (1708/9) — Zaporozhian Cossacks in 1708–09 — that reflects historical events in the late Baroque period. Hrushevsky attached special importance to the Cossack period, for it was then that the national liberation movement was gaining momentum in Ukraine. The researcher wrote that at this time he national revival process began. In this article I prefer to focus on the studies of the Baroque textual systems in Hrushevsky’s works. Nevertheless, the Baroque period is most vividly represented in the two closing volumes of Hrushevsky’s six-volume History of Ukrainian Literature. Here the author offers a historical survey of the sociopolitical, cultural, and religious situation reflected in contemporary literary writings. I must point out that the Baroque period occupies a special place in Hrushevsky’s overall model: the author offers a clear-cut chronology; every book is based on a considerable amount of sociopolitical, cultural, and religious data. This is additional proof that Baroque culture played a major role in the development of the Ukrainian nation. While professionally analyzing literary works dating from the Baroque period, Hrushevsky offers an incredibly panoramic view of historical progress — here it is possible to show the way the historical-political context manifests itself in the cultural and religious lifestyle, in which case literature does not emerge as a phenomenon isolated from the sociopolitical movement. Hrushevsky had belles-lettres in mind, first and foremost. At the beginning of the fist volume, Hrushevsky wrote about literature with belles-lettres uppermost on his mind — works that had special aesthetic value, being capable of reflecting progress in national culture. His foreword to the sixth volume had to do with analysis of literary texts that were at times aesthetically imperfect, but which proved to be of decisive importance for the development of the Ukrainian nation, because they had that crucial impact on the contemporary reader. 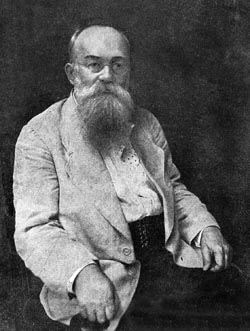 The following is a lengthy quote from Hrushevsky: “I must warn the reader that he will not come across works of high aesthetic value along this road. The Kyiv community apparently had no need for literature per se at that period. Few contemporary authors had this purpose in mind. Conversely, the reader will often be referred to works balancing on the verge of literature and writings ordered to meet some practical goals. We need them because they illustrate the presence of certain literary means that can be put to such practical use. “With regard to ideological topics, one often comes across brief formulas in lieu of more detailed, more literary expositions that have not reached our times or never existed. We need them because we are lacking material. We must look for literary reflections of the dynamics of that epoch, without discouraging this quest by using aesthetically underdeveloped forms. These ideological dynamics are important in following the history of progress of the Ukrainian way of life, culture, and creative endeavors. “Kyiv’s 17th-century cultural construction had its powerful and lasting impact on the purely bookish, school, and other cultural efforts in subsequent centuries, but there were also other, genuinely folk efforts that were free from academic influence: folkways and folk worldviews. Bearing this in mind, it is necessary to use a special scale to assess everything that reflects this construction process, using literary forms in this case. Aesthetic value notwithstanding, this kind of literature was a very active factor of life, actually as active as in the first revival process phase, which was analyzed in the previous volume. Therefore, the aesthetic reception in the Ukrainian Baroque period was supplemented with social, political, and religious significance of the texts. This kind of approach to the historical and literary process in Hrushevsky’s work was motivated by the circumstances of the time.